22/01/15 – Tidied up the pretty terrible write up – all over the place, hopefully better now. 21/01/15 – Populous demo recovered and released thanks to LightSide, including source code! 07/01/15 – Frank Hugenroth talks to GTW64 about Populous. Comments embedded into write up. 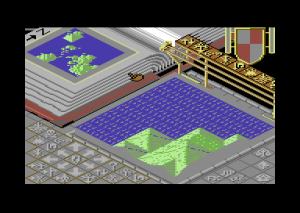 The demo-disk included the first graphics and routines for this game, indicating that the scan shots were in fact real and interactive. The last thing the magazine stated is that they will try to contact the programming team and give them some-sort of legal protection (“Schutzenhilfe”), and follow the development of the game. It wasn’t known how things went with the game, and if 64’er got hold of the game. It looks unlikely due to nothing being released (and the coder later all but confirmed that no-one got in touch with them), but all we had for a while were screenshots from the magazine. Zeldin informed GTW that the guys who made the early screens, did the game “Boom”. After the unsuccessful launch of “Boom”, they sent Zeldin and his crew all their started projects and said: “Finish it if you want!”. 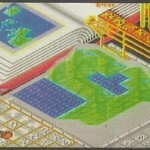 On those disks were the “Populous” graphics, and also the source codes. Coder, Frank Hugenroth, got in touch with GTW64 in 2015 and confirmed that it was created more as a technical demo for the C64 and was contributed initially as a contribution to an animation/GFX competition to 64’er. Frank mentioned that they pitched the potential conversion to EA Germany, but they sadly declined it (feeling that the market had moved on from the C64). In the end, the demo initially created was done just for fun, but has a working grid of 64×64 and can be scrolled. It’s suggested that after EA’s rejection, they did think about using the technique with another game – but it was never to be. Well, one of the AWT members in 2015 – LightSide came to the rescue of GTW64 and has supplied us with the disk which Frank and Andre originally had sent over. Which includes the source code. This includes an interactive title page and a map which can be moved around rather impressively. There is also a tune separately which was not integrated, and is pretty impressive. “Its only a tidbit – I’m not sure how far that version of Populous actually went, but when I was in first talks with Pete and Les at Bullfrog about Flood 2 – they asked me (circa 1991) if I’d be interested in doing a 64 conversion of Pete’s Populous (having just left Ocean and having a raft of 64 routines still fresh in my mind). But for now, check out what could have been the real deal had EA Germany signed it up! A massive shame it never got further, but so glad it has been fully saved! I wonder what the music sounds like. Can not get it to work (yet). Hi No-XS – It should work from basic loader and a SYS code, but there is a fixed up version on CSDB at present which i’ll add here shortly. Thanks Andreas, great work! I’m not sure how the source came to be different to the preview, but I can only guess they lost the very latest version when compiling up the disk to send to AWT. But the magazine never “tried” to contact us (in fact, they knew us). We only had seen a screenshot in one issue without notifying us – nothing more. Technically, the code is very small. The demo supports the original sized (a grid of 64×64) Populous world which can be build up/down, scrolled and is displayed in the overview (“radar”). Ahhh.I was only reading a few days ago an interview with the coder behind the NES version and huge difficulties he had bringing game to the NES, running out of cart space halfway through and game playing at a really slow pace compared to 16 Bit versions, but still remaining ‘playable’.I could only see this ‘working’ on C64 as a cartridge or disk based game.